Grab bars in bathrooms make a big difference for people who have difficulties with standing or rising from a seated position. The grab bars can be installed on walls adjacent to toilets, in bathtubs, or showers to help people with any balance issues while navigating a wet surface. The handicap bars help stabilize someone so that they can safely move from the tub, shower, or toilet without risking stumbles or falls. The Americans with Disabilities Act (ADA) has established regulations for bathroom safety grab bars. The ADA requires grab bars to support 250 pounds per foot and that the grab bar have a clearance of 1.25 inches from the wall. The ADA guidelines also state that the bar should not rotate in their holders, which could create an unsafe situation for people using them. 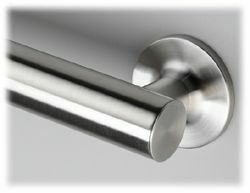 Bathroom grab bars are required in handicapped bathroom stalls in retail and commercial settings. In health care facilities like hospitals, all bathrooms have grab bars for the safety of the patients who occupy the rooms. The grab bars help the patients get up and down to use the toilet and are particularly helpful for patients who have had surgery. Installing bathroom safety grab bars in private homes can help a resident stay in her home so she can live independently. As people age, sometimes they lose their sense of balance and the bars go a long way in keeping the resident safe while he is in an unattended bathroom. A fall in a bathroom can be dangerous, and the safety handles go a long way in preventing unfortunate accidents. Grab bars are not necessarily difficult to install, although someone without the tools or experience to do the project should hire someone with the expertise to install them. Keeping the grab bars clean is fairly easy. Most of the bars are made from stainless steel which is easily cleaned with disinfecting products and a soft, damp cloth. The key to buying bathroom safety grab bars is getting one that fits your needs and the environment where it will be installed. Can you drill into your walls or do you require suction bathroom safety bars for an apartment? Since bathroom safety bars are affordable, the costs are usually negligible in your decision making. Make sure it supports your weight, is easy to grab, has a good grip and can be firmly fixed to the bathroom walls as priority number #1. Chrome Bathroom Grab Bar – Provides support and capable of supporting 250 lbs. Stainless Steel Grab Bar – This is a heavy duty grab bar capable of supporting 500 lbs. If you are concerned about having accidents in bathrooms, then these bathroom safety grab bars should be number one on your must buy list.